I'm too tired to include a polish list since I used so many.. bad nail blogger, bad. LOVE! These are beautiful! I can't believe some douche claimed you photoshopped them. HAHA! Great nails! Totoro is so cute! I love Miyazaki films. Spirited Away is one of my favorite movies of all time. It is incredibly moving. Thanks bb! God, don't even get me started.. I get so pissy when people accuse me of shopping my nails, haha. Thank you! Spirited Away is definitely in my top ten movies, it's so touching and magical. I wish my life was a Miyazaki movie. Thank you! :) I used nail polish for everything except the brown bits, which is acrylic paint since I don't have brown polish. I just use regular paintbrushes from the craft store that I trim/shape to be super thin. Absolutely fabulous! 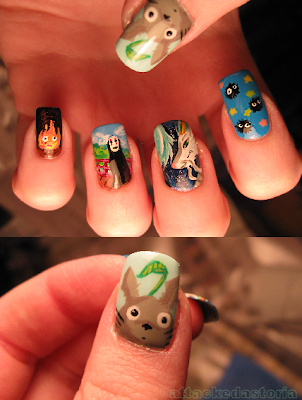 I love the Totoro nails especially, though since they're all Miyazaki and Studio Ghibli they all rock! Why yes, I'm a geek.